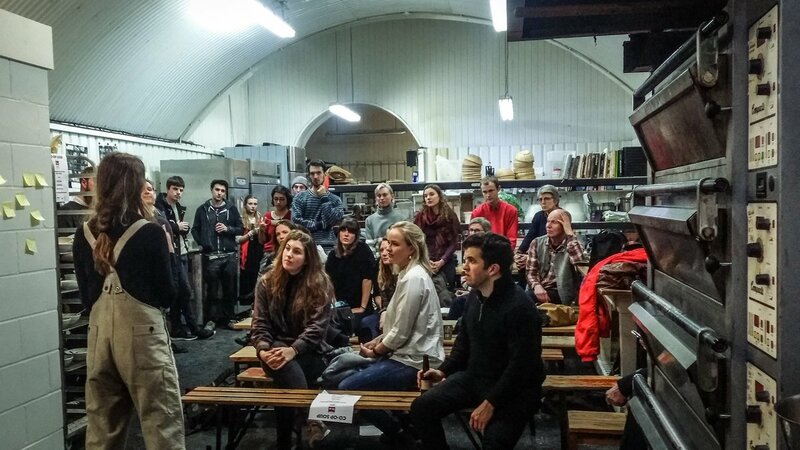 On November 25th, Stir To Action and Alt Gen partnered to launch the Co-op Soup in London. It was hosted in the railway arch at the E5 Bakehouse, and was supported by the Solid Fund and wholesale co-operative Suma. The event was inspired, originally, by the Detroit Soup, but more locally, by our friends at the Bristol Soup in St.Pauls. The idea is simple: For £4 you get a bowl of soup made by the team at Greenwich Co-operative Development—Spicy Moroccan Chickpea Soup and bread from the E5 Bakehouse—and a vote that you cast later. During the evening you hear from four co-operative projects who pitch for four minutes about their idea, its benefits and what the funding will support. Each pitch is then followed by four or five questions from the audience, and then the crowd votes. The winning project receives the takings from the door and pledges to share how they’ve used their funding at the next Soup. #OurField is a cereal co-op movement that aims to change the way we grow grains forever. We are organising a co-operatively owned field of (heritage) grain with a farmer - and inviting 40 Londoners to co-invest. The 40 co-investors will take part in key decisions throughout the year, led by our farmer and a facilitator, and participate in events on the farm. They'll be making decisions alongside the farmer: whether to go full organic, use a cover crop, go no-till... There are many possibilities! At the end, they will vote and decide on where to sell their grain - and see whether they have made a financial return at the end of it all. Our aims are to: reinvent farm economics, connect consumers to farmers and the land, and help farmers transition to more agro-ecological practises and nutritious produce by sharing their risk while trying out something new. We will be documenting the process and creating an opensource blueprint to share with others and spread the #OurField movement. #OurField is supporting the co-operative movement by paving the way in cereal co-ops (none exist to date) and highlighting how important co-ops are in reinventing the way we grow our food. Farmers operate on extremely slim financial margins and often a transition to innovative or more agro-ecological practises is out of the question due to the risk and lack of support. Co-ops could really help here, and spread into this area, beyond community supported agriculture (CSAs) where the pressure is still on farmers to produce high output. We also support the co-operative movement by creating a blueprint for others to be able to go on and replicate our model, and putting the focus on empowering others to follow in our footsteps. This is not a one-off project, it is a co-op movement! We are currently applying for a range of small grants but all of them have longer timescales before we hear about the outcome. We are launching our project on the 1st December at an event in central London and at the moment paying out of our own pockets and relying on volunteers to put this on. Co-op Soup funds would give us what we need to reimburse volunteers and venue rent. We are hosting a dinner party out of recycled waste food which we will need to collect on the night from various London locations and paying for van rental and fuel costs is also a concern. Any money left over can be fed into paying for our facilitator who will be working part-time from March until harvest. An online marketplace that makes it really easy to meet your needs with 'ethical' solutions. As a multi-stakeholder cooperative Fairmondo UK is owned and run by it's members (workers, consumers & traders). Imagine an Amazon marketplace owned by you. Imagine accessible, easily searchable, transparent, community curated information about products and sellers. Together, in one marketplace, we can link up and grow the 'new', 'alternative' and 'ethical' economies. Buy the good! Co-operative enterprises form an integral part of the 'alternative' and 'ethical' economies. By connecting ethical consumers with ethical producers in one, ubiquitous marketplace (making the ethical easy) Fairmondo UK will be a rich channel of trade for cooperative businesses. Because Fairmondo UK is itself a co-operative (with many member cooperatives) it is committed to principle six. The primary application of profits will be directed towards growing the cooperative movement. Fairmondo UK is a tech startup but, unlike traditional startups, selling shares to venture capitalists doesn't really work. So far finding any funding has been difficult and we are entirely self funded. Whilst the Co-op Soup won't be enough to build the next Amazon marketplace, it will go a long way in supporting our work! Specifically, we will use the funds to develop and run a crowd funding campaign we are planning for 2017. The Soup will allow us to find and pay for marketing and design expertise (hopefully from the coop movement) and will also enable us to work more closely with our fellow platform cooperators resonate.is. Resonate are currently running their own crowd funding campaign using a collaborative marketing tool they have developed for their site. Successfully integrating the knowledge and resources from Resonates campaign will require some paid work. We’re SheCanCode, a social enterprise that aims to bridge the gender gap in technology. We believe that a diverse and inclusive workforce, wherein stereotypes are overcome and female employees are motivated to contribute through an awareness of the career potential they bring, is crucial in order to encourage different perspectives & ideas that drive innovation. We are currently addressing this multidimensional issue in many strategic ways (we can explain these in our pitch), while constantly building on our community through industry events and our increasingly popular blogsite. In January 2017, we’re launching our first ever e-magazine. We’re looking to expand and enhance our blog readership by offering a themed monthly which is in line with our core values. This project will be a landmark in SheCanCode’s trajectory. Our mission dovetails with the co-operative movement. Our goal is to fix the demand-supply gap for diverse tech talent by empowering and animating the community. This project supports the co-operative movement because our e-magazine will provide a targeted medium for engaging, inspiring, and informing women and men to act as agents of change. Our approach is highly collaborative. Our magazine would be no different, with features involving partnerships and the promotion of other diversity-oriented organisations with similar values (e.g. Women Hack For Non Profits, Founders & Coders, Codebar). We are stronger together. The Young Co-operators Network (YCN) is a national network of co-operators from across the UK created to support young co-operators and co-operatives in their journey toward a sustainable and democratic working life. It functions as a network of individual co-operators, placing emphasis on the importance of the co-operative values and principles to effective democratic participation. The YCN aims to support its members and promote co-operativism amongst young people through engaging in collective problem solving, hosting and delivering workshops, and providing experience of direct democracy in action. The YCN is an open organisation for those who have a desire to know more about the co-operative movement, want to better understand how co-operatives work, are in the process of establishing a co-operative, have recently joined a co-operative, are seeking solutions to challenges they and their co-operative might be facing, or simply wish to engage in the sharing of knowledge and experience. The Young Co-operators Network augments the capacities of the UK co-operative movement in terms of engaging, inspiring, and supporting young people in co-operativism. Furthermore, it provides a platform from which young co-operators can learn about co-operatives, develop their democratic awareness, and ultimately challenge the movement in a constructive manner. This means identifying and experimenting with methods of being more participatory, more effective, more sustainable, more democratic, and more co-operative. By placing the co-operative values and principles at the centre of the organisation and using these as the foundation for supporting brave and resilient co-operators we hope to contribute to a co-operative movement that is equally brave and resilient. Currently, the network runs off the time and energy volunteered by its members but this can only carry us so far. The YCN has identified five areas where development, and therefore some form of investment, is necessary: activities, in terms of the engagement delivered or received by the members; interactions, in terms of the opportunities provided for participants to meet; resources, in terms of information and experience shared internally and externally; membership, in terms of the engagement of young persons and young co-operatives as well as those not yet involved in co-operativism; and structure, in terms administrating and maintaining the network itself. The funds raised through this event will be invested in two of these areas of development, resources and structure. This would include: the design and development of a brand identity and dedicated website; enabling members to be remunerated for network administration duties, especially when organising gatherings and workshops.